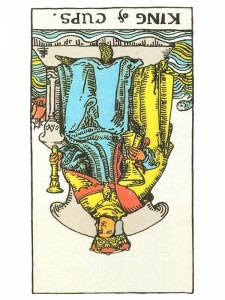 King of Cups (R) says create your own happiness – stop waiting passively for life to wait upon you. Re-assess your priorities, your loyalties and your commitments. Eliminate the “should’s” and begin to move toward that which has vitality, heart and meaning. Recognize that people are not always what they appear to be – they can be powerful and put you down. Accept that there is always a possibility of double dealing or loss with any person or situation. If you feel you have been treated badly or misled – avoid any disagreements or violent emotions can emerge from your calm exterior because of the pressures caused by these outside events. Seek to find your solution by forgiving and extending compassion. In the first position: How you balance your kingly qualities with your emotional sensitivity may be the test of this lifetime. In the second position: At one extreme, this suggests that you have someone you can fall back on who may have been your safety net – but it is not as strong for you at this time. At the other extreme, there may be too much support that you have relied on too heavily for your own independent development. In the third position: You need to heed the King of Cups for your own benefit, but there are others who depend on you for your soothing, healing presence. In the fourth position: Distorted, this otherwise very healthy archetype can become a block instead of a blueprint/foundation for love and creativity. At one extreme, the figure is idolized and idealized and real life will find it hard to compete. At the other extreme, the figure is loathed and by extension either all men or all of a certain types of men are not to be loved/trusted. In the fifth position: You may think adversely about this king or he about you. There may be a tug of war between responsibility and your lust for life. In the sixth position: If the king is someone in your life already, this can show a problem. At one extreme, there is such a showering of affection that it can create difficulties, a smothering effect. At the other extreme, there is a lack of caring attention to support your needs. In the seventh position: At one extreme, the charming character here can distort into the charlatan. At the other extreme, the messenger can succeed all too well leaving the message in the shadows. In the eighth position: At one extreme, there may be a strong influence, a person who can easily persuade you to go into too deep water. At the other extreme, this person who charms you may be working absolute wonders healing your physical and material woes. In the ninth position: Your heart may be involved with this king, but rather not be. Or, the opposite, this can be the symbol of your heart’s sadness over this person. At another extreme, you may be enjoying yourself a little too much for your situation.